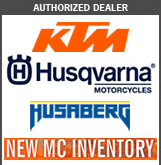 CycleBuy is an authorized KTM , Husqvarna, and Husaberg Dealer offering Husaberg parts, accessories, and service to Husaberg customers in Oregon, northern California, southern Washington, and throughout many parts of the world. Our large inventory of offroad motorcycle and dual-sport motorcycle accessories includes most items a Husaberg owner will want to put on their bike. To look up and order parts for Husaberg models, go to this page: (opens in a new window) http://sparepartsfinder.husqvarna-motorcycles.com/?lang=en Search for your model. Lookup the part number(s) needed, and copy/paste or enter them in the form below. Search Hint: to find your bike easily, use this format in the "Select Model" box "2008 FE 550", then select the model for your country (US, AU, EU), then choose "Engine" or "Frame" and click "Search". You can also enter your VIN to quickly locate your model. We stock common maintenance items and accessories for 2009-14 Husaberg motorcycles and will gladly special order parts for older models. To order parts for 2009-14 Husabergs online, select the pdf file for your motorcycle below, lookup the part number(s) needed and enter them in the form below. To Order: Download/Save the PDF file for your bike to your computer and look up your part numbers. Superseded Parts: If you enter a part number and it is superseded to a new number, you will need to order and pay for the "Superseded to" part number. Part number with / or space: If your part number has a space (78030007300 I), enter "-" in the space (78030007300-i) The letter i and not the #1. Errors? : Some part numbers are still not in the parts file we get from Husaberg and we need to manually add them. If you get an error after entering a part number, please send an email to Sales@CycleBuy.com with the part number so we can fix it. Returns or exchanges may be allowed within 30 days. RMA number required prior to returning any item. Restocking fees may apply. No returns on electrical components.